Co-sponsored by the California Western School of Law, the dinner event will feature a performance by members of Quartet Nouveau (http://www.quartetnouveau.com/#!video/c1evn,) a chat with Ambassador Harry Thomas, a literary auction and a reading from The Mango Bride – you know, the novel that went from quick and dirty draft in Nanowrimo 2008 to winning the Palanca Awards in 2011 and the San Diego Book Awards in 2014. I can’t waste time doing the humble brag lap because this is truly for a good cause. Even if you aren’t in California and would still like to support our work, you can do so by clicking on that same link. 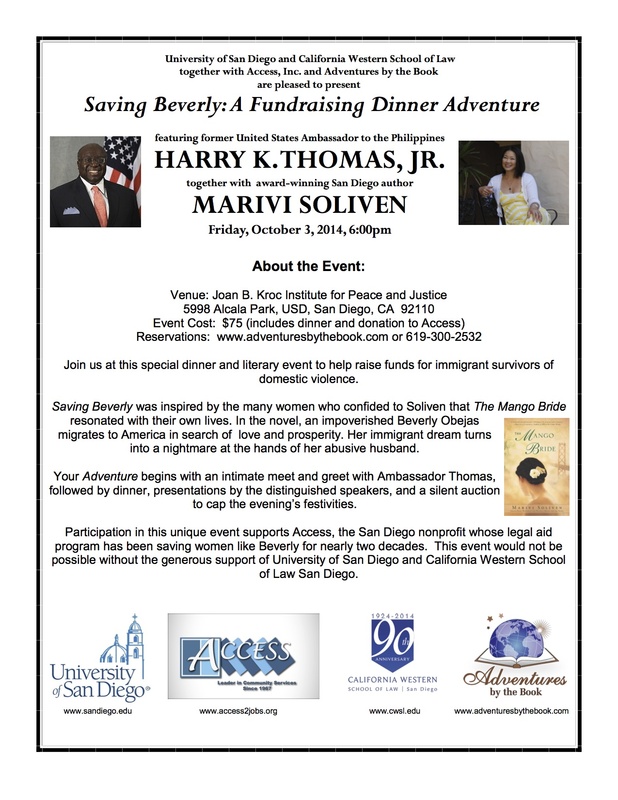 The Mango Bride traced the life of Beverly, a fictional victim of domestic violence. Now you can save someone like Beverly in real life, just by joining the party on October 3. It will be SO much more fun than bathing in a bucket of ice.